With the aid of the very latest testing technology, we test our filters according to the standardized performance tests of national ASHRAE and international standards. 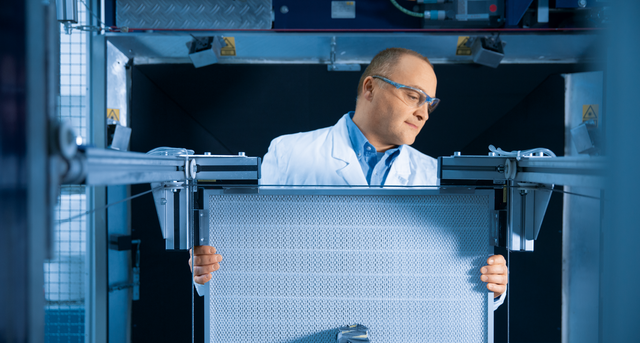 These tests are supplemented with stringent special tests in Freudenberg's own test laboratory, in which filters must pass even stricter requirements. Besides the usual tests in accordance with national and international standards, each filter is also subjected to Freudenberg’s own specific tests conducted under much more rigorous conditions. These special tests are developed by our test engineers to check compliance with the specific requirements of very diverse applications. They include exposing the filters to atmospheric dusts, soot and synthetic fine dusts under intensified flow and moisture conditions or higher dust concentrations, tests conducted under extreme climate conditions and many, many more. To supplement these laboratory tests, the filters are also tested under real conditions, and only then is the development of a new filter regarded as concluded. These performance data provide valuable knowledge which also forms the basis of our continuous product development and optimum customer service.